Sophisticated Golfer was the first travel company to offer this dynamic ‘best of’ the Dominican Republic golf tours in 2005 coinciding with the island’s golf boom. Our Dominican Republic program is unsurpassed in the world of golf tourism. Dominican Republic Golf courses available to play include; Teeth of the Dog, Dye Fore, the Links, La Estancia, Punta Espada, Corales, plus Cana Bay and La Cana. Begin your stay with arrival at Punta Cana International airport (PUJ) and prepare for transfers to the Casa de Campo Resort in La Romana, about 45 minuets drive away. Enjoy a greeting at the airport upon arrival by drivers arranging for private transfers. 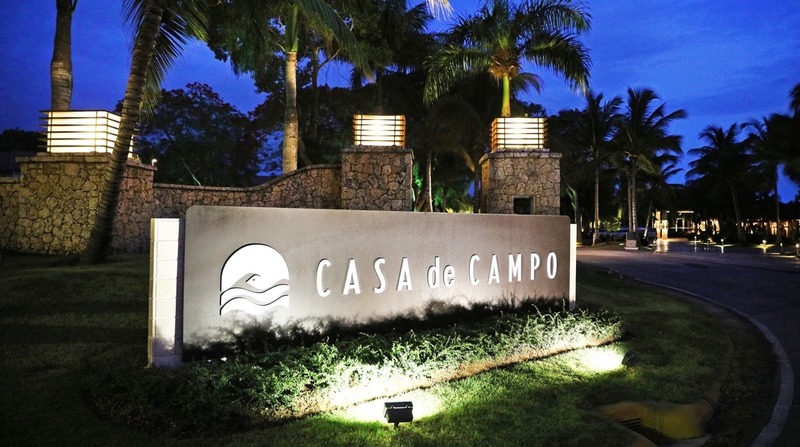 Check-in at Casa de Campo Resort and begin your stay. Play Pete Dye’s famous masterpiece Teeth of the Dog opened in 1971. Teeth of the Dog has been ranked as high as 35th in the world and is consistently rated as one of the top courses in the Caribbean. The course is beautifully designed along the Caribbean Sea. Play Dye Fore at Casa de Campo opened in 2003 and designed by Pete Dye. 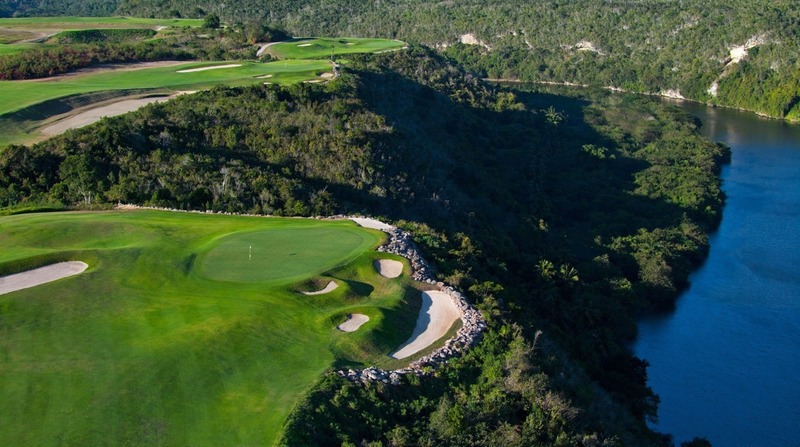 Dye Fore is a 7,700 yard course offering 18 holes running parallel to the Chavon River with breathtaking views of mountains and Caribbean Sea. There are 27 holes at Dye Fore should you want to play 9 more, additional. Play Teeth of the Dog at Casa de Campo for the second time on this morning. Alternatively choose to play the Links at Casa de Campo or La Estancia golf course designed by P.B Dye located in the La Estancia community in La Romana, 20 minutes away from Casa de Campo resort. Following golf this afternoon check-out of Casa de Campo Resort. Transfers are provided for you back to Punta Cana. Arrive in Punta Cana and check into your Punta Cana area accommodations at the Cap Cana or the Punta Cana Resort & Club, Punta Cana region accommodation options available below. Begin your 4 nights stay. Play the La Cana golf course by P.B. Dye. The La Cana course is innovative, challenging, and fun to play. It’s long, playing to 7,152 yards from the tournament tees, but the rewards include four superb holes playing directly along the Caribbean Sea with magnificent views. There are 27 holes at La Cana should you want to play 9 more, additional. Alternatively with stay at the Hard Rock Resort play Cana Bay golf course designed by Jack Nicklaus across from the Hard Rock Punta Cana all inclusive resort. Play the spectacular Corales course by Tom Fazio. Corales is set between rocky cliffs, coral reefs and the expansive Caribbean Sea. The course features 6 oceanfront holes, multiple lines of approach, and picturesque canyons. This exhilarating challenge culminates in the striking 18th hole with a dramatic carry over the rocky bay of Corales. Check out of your accommodations and bid the Dominican Republic farewell. Transfers back to PUJ, Punta Cana airport are included with driver service. Depending on flight time choose to play an additional round on Punta Espada, La Cana, or Corales or Cana Bay. Arrangements can be made to have your luggage stored in the golf course’s pro shop or locker room during play. Golf on this date can be added custom. Casa de Campo Resort is the recommended option during stays in La Romana. Choose from hotel rooms or 3 and 4-bedroom villas. Casa de Campo is the premier partner golf resort of Sophisticated Golfer and one of the most popular golf resorts in the world. In Punta Cana we recommend the Punta Cana Resort & Club for its location to the best area golf courses. Alternative options for luxury stays include the 5 star perfectly located Tortuga Bay Villas, part of the Punta Cana Resort & Club. We also recommend stays inside the Cap Cana golf community at the Golden Bear Lodge (above sample package based on stay at this location) featuring 1 and 2 bedroom villas and the 5 star Caleton Villas Cap Cana. Both of these villa options offer preferred play on Punta Espada golf course. For packages with All Inclusive Meals and Drinks with our best of the Dominican golf tour we recommend the Sanctuary Cap Cana golf resort (above sample package based on stay at this location) located inside the Cap Cana development 20 min from the Punta Cana airport and the Hard Rock Punta Cana Resort & Casino located about 45 minutes north of the Punta Cana airport and offering preferred play on the Cana Bay Palace course by Jack Nicklaus. All best of the Dominican golf packages can be fully customized. 5, 6 and 8 night custom golf packages available. Groups can select 3 or 4-bedroom villas at Casa de Campo & villas inside Cap Cana.